Scientists and the scientific community receive some fairly standard advice when it comes to direct response to some animal rights groups’ stunts and campaigns. What is it? Typically some variant of: Ignore it. Don’t give them free publicity, the attention just helps them grow. Don’t acknowledge that their campaigns affect us, it will just reinforce and encourage them. They win if it gets to you; they win if you take time and energy away from your science in order to respond. The question is whether this advice, fairly standard over at least the last couple of decades, is good advice. Is ignoring animal rights and absolutist campaigns a good idea? Is it effective in the short-term? Does it decrease an individual scientist’s risk of being subjected to harassment campaigns? Does it decrease an institution’s exposure to activists’ campaigns and “bad” publicity? 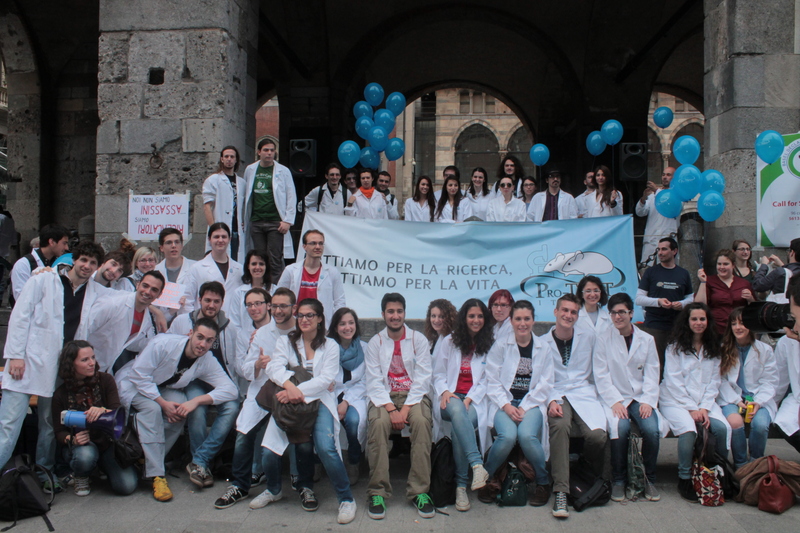 Pro-Test Italia: They’re not ignoring the problem. What about the long-term? Does an “ignore it” strategy work against the goal of promoting public understanding of the role of humane, necessary and legal nonhuman animal-based research is science and medicine? More broadly, does a blinder-based strategy hinder efforts to increase scientific literacy and understanding via scientists’ participation in public education, outreach, and engagement? Unfortunately, there is little solid data or empirical study to support an evidence-based approach in selecting the best strategy for responding to various campaigns by groups opposed to nonhuman animal research. What if we look to the current state and conclusions of those engaged in fighting back against other anti-science campaigns? Campaigns to undermine other areas of science and medicine, ranging from evolution to climate change to vaccines, have resulted in significant negative effect on the public, science, and scientists. Viewing all of these, we see that almost without question, more public engagement and accurate information is what is required to mount an effective defense and to bring informed, serious consideration to a public that otherwise may fail to hear us above the noise. We also see robust education efforts for evolution, climate change, and vaccines. We have written many times here about education and outreach programs for nonhuman animal research and the perils of “no comment” approaches. On the animal research front, history also provides evidence that we should not always ignore what appear to us as outrageous and ridiculous stunts and campaigns. Ignoring them does nothing to diminish their impact or growth. Nor does silence provide help for those who would like to respond but may not have full or accurate information with which to address the issues activists raise. Despite being primarily ignored by the scientific community for decades, animal rights groups have not gone away. Their number, reach, income, and supporters have only grown. Consider PETA, for example. Founded by two activists in 1980, it is now arguably the most famous animal rights group in the world. They also claim to have three million members and supporters. PETA’s 2012 revenue of over $30 million, with $15 million going to outreach and international grassroots campaigns, solidly demonstrates its growth over 30 years. Ignoring PETA has not made them go away. Nor does PETA’s success depend upon attention directed at them from the scientific community. At this point in time, a mix of celebrity endorsements, stunts, and emotive campaigns successfully drive and sustain PETA’s publicity. Additional efforts by the scientific community to counter campaigns of misrepresentation, provide accurate information, and to condemn PETA’s promotion of violence toward scientists can at least make sure that the voices of scientists are heard in the media coverage. In some cases effective engagement early on can help journalists to see that the claims are inaccurate, and stop the story in it’s tracks. On the contrary, an argument can be made that ignoring PETA’s escalating antics and failing to advance a public counter to their claims may have facilitated the success with which PETA has gained support. For example, if there is no public response or condemnation when PETA does something like releasing a videogame that promotes “beating up” scientists, the game is unlikely to go away. 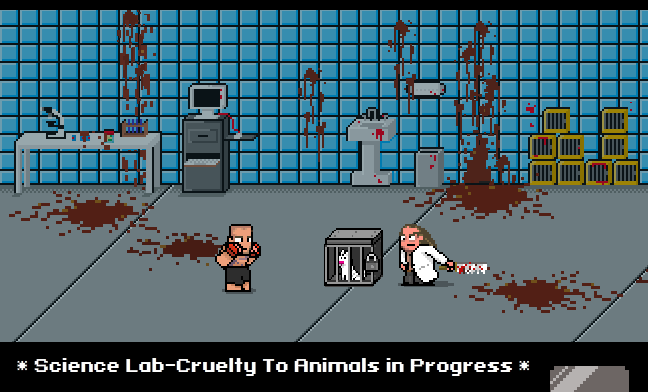 There will be little chance that scientists will reach this audience in order to counter the game’s gross misrepresentations of laboratory animal care. If we say nothing, the individuals playing the videogame, the game’s designer, and those providing positive media coverage of the game will fail to receive the message that it is not ok to promote violence against scientists (or others with whom you disagree). In effect, violence against scientists will be further “normalized” as a tactic that can be rationalized or acceptable. Failing to respond to PETA’s game and failure to launch a sustained and effective response to other animal activist campaigns has another downside. Without a firm response we may signal that animal-based research is a relatively weak target for activists’ campaigns. Scientific animal research is a tiny fraction of all human use of nonhuman animals. Yet the energy and resources activist groups direct toward this use likely outstrips that directed to agricultural use. There are multiple reasons for this. Among them is that the great majority of the public eats animals and is unlikely to be sympathetic or comfortable with campaigns against agriculture. Another reason is that laboratory research and science in general are more difficult for the public to understand. As such, they are easier to misrepresent, particularly if the scientific community doesn’t effectively, consistently, and strongly counter with facts. Finally, scientists likely appear to be relatively easy targets for harassment. Can we counter this effectively? Yes. Beyond engaging in more public scientific education, there are a number of ways to protest when PETA does something like launch “Cage Fight.” Draw public attention to it. Explain why it should be condemned. Write to the fighters and their sponsors. Write to the celebrities endorsing it, to the company that designed the game. Ask scientific societies to speak out against this tactic. It is sometimes puzzling that the scientific community expresses relatively little interest or sustained attention to the efforts of animal activist groups that aim to end our work. Competing time demands are the primary reason, but probably not the whole story. Rather, many may be unconvinced that the activities of these groups will have any substantial effect on science, the public, or the future. Parallels to the effects that climate change denialists, anti-vaccine proponents, or creationists have had on science and the public suggest otherwise. It may also be the case that most scientists are simply unaware of the scope and depth of activities by groups like PETA. Rather than assuming knowledge of the current state, reach, and effect of anti-animal research activism, take even a few minutes to pay closer attention to PETA and other groups. View their materials not only through your eyes, but also those of students and other citizens who have a voice in policies that affect science. One starting place: Look at these four websites—each designed for a specific demographic group. In other words, ignore the standard advice and consider that it may be time to change strategies. Consider that our efforts at education, outreach, and public engagement need to continue to evolve in order to be responsive and relevant. When we largely ignore groups that oppose animal research, we also remain ignorant of the messages and information that the public receives about our work. In turn, we miss opportunities to bring scientists’ knowledge and perspectives to discussion that is occurring in widely-consumed public forums– blogs, facebook, twitter, and other media. These discussions will not stop or wait for scientists to contribute, they will simply continue without the balance that we could provide. The rise of groups like PETA has demonstrated that the ear of the public is attuned to hearing about animal research, especially so for those who have grown up with PETA. In order to be heard, however, we also need to listen and to understand public questions, concerns, and priorities. Despite all of the escalating pressures on science, it is time to renew and increase efforts to more broadly communicate to the public that our science is in their interest and to their benefit. Some may choose – as animal rights groups and absolutists advocate—to believe that animal research should end and that all should forgo the benefits that it produces for society. More likely however, is that those who understand the necessity and benefits of the work will also understand that the choices PETA offers are not harmless. It is for this reason that groups like PETA have the most to gain when we remain silent. In absence of counter with accurate information they are able to paint a picture of a world in which ending animal research has no downside for the public. It is up to us to show this cartoon vision is false and to engage the public in serious dialogue about the challenging decisions that science presents to all of us. Posted on June 24, 2013 June 24, 2013 by EditorPosted in Animal Rights News, Campus Activism, News, Outreach NewsTagged animal research, animal rights extremism, animal testing, media, peta, public outreach. Is science an “unequivocal good”? Does research justify any method? That is an argument that Dr Mengele might have proposed. The article assumes that all scientific research is both necessary and productive. No mention is made of the moral debate – it is absolutely clear that a very large proportion of vivisection is done repetitively and arguably unnecessarily – for example the tests to see if smoking is dangerous, if cosmetics can harm the eyes if dripped in them constantly, if poisons will kill. The question that should be asked is: if animals are like enough to us to give useful test results, then how can they be so different as to justify a total lack of moral consideration? 1) No, research does not justify any method. 2) We repeatedly engaged in the moral debate (just look up our posts here). 3) Animal physiology is sufficiently similar to allow us to study some human diseases and develop therapies/cures, however their minds and ability to suffer is not. 4) No, we never justified a total lack of moral consideration. Descartes claimed animals were “automata” who felt no pain – to prove it he would dissect them, fully conscious (the animal, we can’t be sure of Rene), and explain away their cries of agony as irrelevant, as they had no souls. I hope we have advanced beyond that paradigm! To state that animals such as primates or other mammals do not have the same ability to suffer as another mammal, Homo sapiens, goes against common sense and scientific research. For example, Marian Dawkins’ book “Animal Suffering:The Science of Animal Welfare” argues (among other things) that there is no logical correlation between intellectual capacity and ability to feel pain – in fact the opposite may be the case. Descartes lived 400 years ago… I don’t think you will find many scientists that declare themselves as Cartesians today. I’m working my way through the fascinating debate below that article. Hate to tell you, but I think Francione wins on points. I don’t think it’s worth rehashing it all here as it is covered in such depth there, but I would say that none of us can truly feel another’s pain. I grew up on a dairy farm where the cows had their babies torn from them at 12 hours. They bellowed with misery all night, often for weeks. I have also met human parents who have abandoned their kids or left them in cars to go gambling, without a second thought. My bottom line is that we all (except for a few psychopaths) agree that the infliction of unnecessary suffering is morally wrong. It appears from your comments in the other debate that you may agree with me that eating the flesh, secretions or ovulations of other animals may not be necessary, definitely causes suffering and therefore is wrong. You argue that some experimentation is necessary – presumably you would exclude repetitive vivisection such as done by bored children in schools, testing done to prove what we already know (like “smoking is harmful”) and testing done for vanity (cosmetics)? That leaves a very small circle we are still arguing about. If you agree with Francione with the notion that we owe the exact same moral consideratino to all sentient living beings then we are worlds apart. If, instead, you believe all living beings are due moral consideration but necessrily in equal degree, then you are an animal welfarist, and we mostly agree. It is possible for us to still differ on what you would find morally acceptable in terms of animal use, but our basic philosphical positions are the same. The question boils down what you and I see as “necessary” harm… and weather you accept the scientific consensus (92 percent) who agree that animals are needed to advance medical knowledge and human health. We accept that science is an unequivocal “good” and we want the public and its media to do likewise. Just because the other issues you mention have been politically managed by their opponents in ways similar to the opposition to animals in biomedical research does not mean we will necessarily draw strength from alignment with those issues. Indeed we may garner new opposition from those other issues’ opponents. Biomedical research unequivocally provides answers to biological questions and sometimes/eventually methods to manage disease. Emotional appeals on behalf of individual research animals do not change that fact. Immunization is also an acknowledged good, despite a vocal minority of conspiracy theorists advocating against. While our herd immunity may be less than ideal, most people are still unlikely to risk their children’s lives to make a philosophical point or refuse vaccination due to real fear. Individual pediatricians and individual mothers will continue to see to it. Creationists rebel against the loss of faith and a widespread rejection of an immutable touchstone of right and wrong in a secular world. They need not reject all science to believe what they are seeing is a growing immorality in society. Their way of expressing that, to insist on a role for faith in education and to question evolution in support of that role, need not limit biomedical scientific inquiry. “Creation theory” need not impede other areas of science. The climate change issue debacle, was always doomed to disrepute because of the highly political way in which it was first communicated to the public, the opaque manner in which some involved scientists debated their findings and the greed exhibited by some of those who stood to profit from widespread acceptance of its principles. Albert Gore comes to mind, along with various wind power and solar power schemes. Solyndra too. Climatology, while answering questions, also seems much less likely to provide solutions. Advanced societies are unlikely to choose a return to the Dark Ages. Promoting biomedical science, and aligning with other societal goods: agriculture for example, should be pursued. We are in the right and its past time to say so proudly.